At the middle and high school level, students may have the opportunity to work in the library media center. This is an application form for students and teacher recommendation forms that are to be given to teachers. 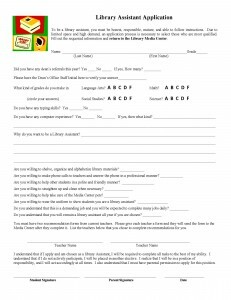 If you are a media specialist wanting to “hire” assistants, these forms are for you! This file is in Word so you can customize each form to meet your individual needs. I’ve used these forms for the last 8 years and usually have a staff of 30-36 students each year. At least 80-100 students apply for the positions, so having a thorough application along with teacher input has really helped me make more informed choices for assistants. The preview image does not show two complete teacher recommendation forms, but the files is correct. Any issues after purchase? I’m only an email away!